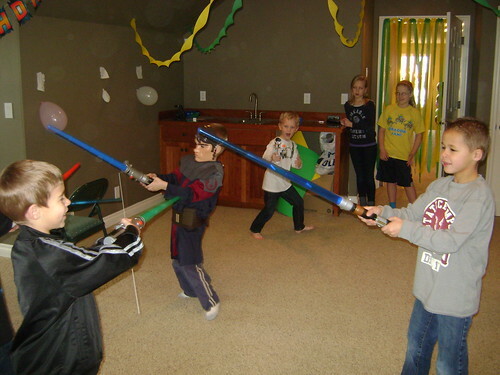 And how else would he celebrate but with a Star Wars party? First of all: Please do not be intimidated by my lavish decor and professional party planning skills. I know how blogs can invoke jealousy, and that is really not my intent with these crepe-paper-twisties and balloons-taped-to-the-wall. What can I say? Such unique, designer ideas just ooze right on out of me. I guess it’s just my thang. 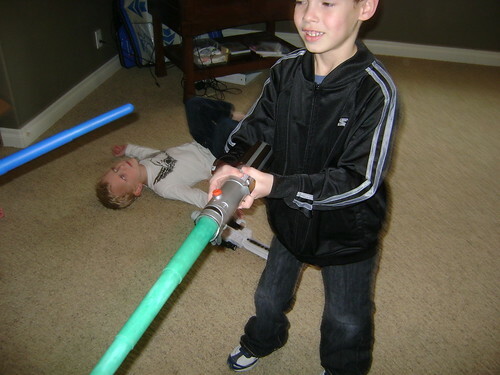 Nine–yes, nine—little boys showed up, each with a lightsaber or stormtrooper gun in tow. (We encourage violence in these-here parts.) 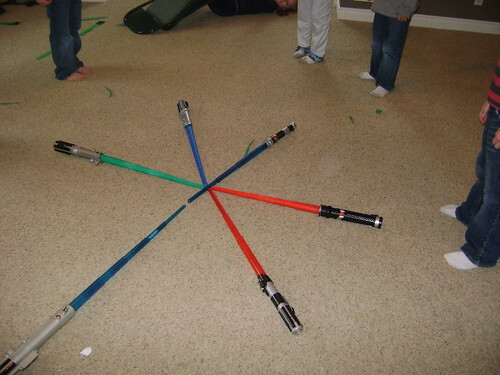 When we ran out of games, the boys just receded to a massive, all-out lightsaber war. I watched mutely from the sidelines, unwilling to disturb the perfect Lord of the Flies aura that prevailed. Not going to ask. Not even. going to. ask. Patiently awaiting their turn at Pin the Lightsaber on Darth Vader. Notice Megan’s megaphone. It looks like a toy but I’m telling you, it works. She used it all day to herd the cattle from one activity to the next. I was happy for her that she finally found a way to talk over all the blasted noise in this house. 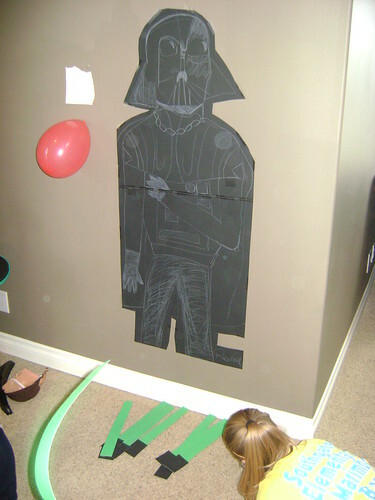 Rachael whipped up this paper Darth and accompanying lightsabers the night before. She, Megan, Bailie and Natalie (their cousins) worked like crazy to help plan and decorate for the party. They then won my heart forever by hosting all of the games and helping me supervise on the Big Day. The crowning achievement came when they led the boys on a rather involved Rescue Princess Leia treasure hunt that they had created. (The princess was finally rescued in the big red wagon out in the garage, and and all of the Jedis were rewarded with a Ring Pop.) The older girls had fun re-living their younger birthday-party years; Nat even admitted to me that she still loves a good helium-filled balloon. And it gets even better. Julie didn’t stop with his face and those eyes. No, no. She busted out Yoda’s cloaked shoulders as well. 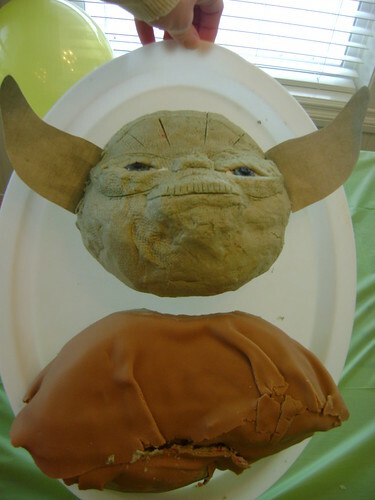 Check out the multiple layers of poop-brown fondant delectably folded over itself. Mouth-watering, is it not? I had to sit on my hands to keep from grabbing a fork and digging in before the guests arrived. 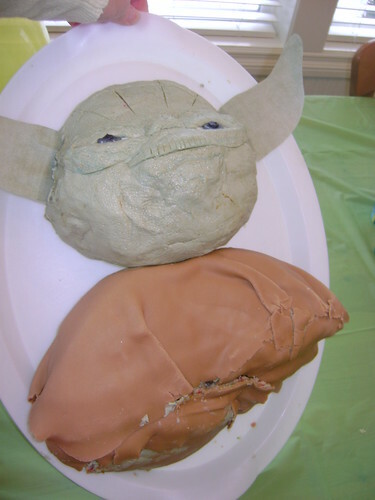 Yoda endures a slow, painful decapitation as Mom realizes she should probably quit taking pictures and put the cake on a flat surface. All kidding aside, we were thrilled over this fun cake. My sister really should become one of those MormonMommyBloggers–she’s that good. (I just didn’t give her an especially pretty subject to work with.) Thank you again, Jewely! We love you, Easy E! Happy 6th! Happy birthday Big E! Fabulous job Mom! 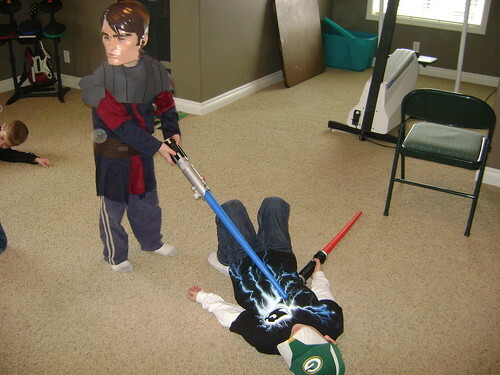 Love the Darth Vader idea, reminds me of making “Pin the rock on Goliath” for sharing time once :-)I am so glad Ethan has his own ‘rock band guitar’ too, he’s pretty good with that at our house (even though I can’t get the game to work, he’s totally cool about it)! That cake is awesome! 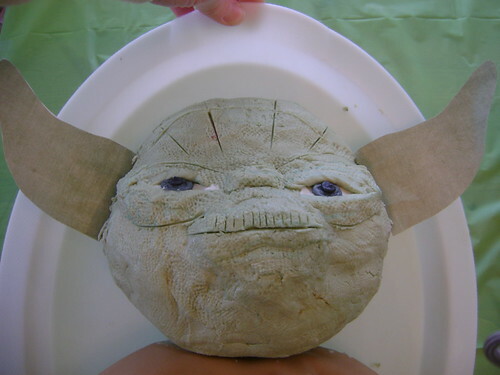 Zach is such a boy and leaves out all of the good info, like a totally awesome Yoda cake! Happy Birthday E! 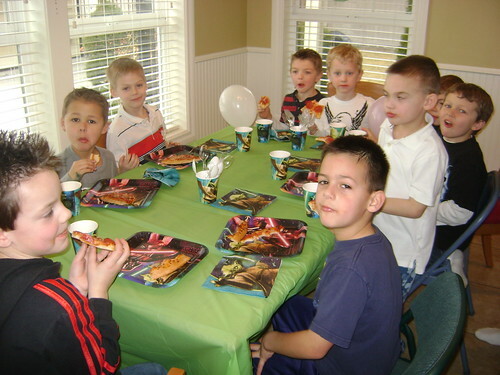 So glad you had a bust out party! You are so lucky to have such talented party planners at your house! 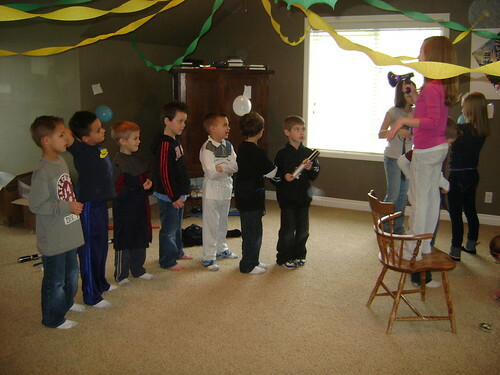 AS for your mom – nine boys – slightly crazy but it looked like a lot of fun! Love the cake – pretty good for a wrinkly not all that cute character!! 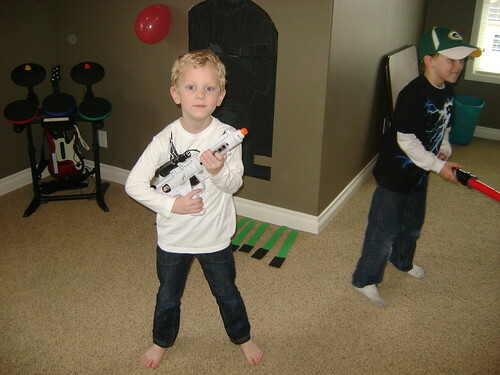 Happy Birthday Easy E – you are such a cute kid!